Situated between mountains and the sea, the golf course is certainly one of the most beautiful on the island with amazing views of the lagoon on one side and the hills of the Black River Gorges Nature Reserve on the other. The naturally hilly landscape features many lakes, streams and tropical flora, the natural fauna is prolific and includes a wide variety of protected bird species and a family of deer! 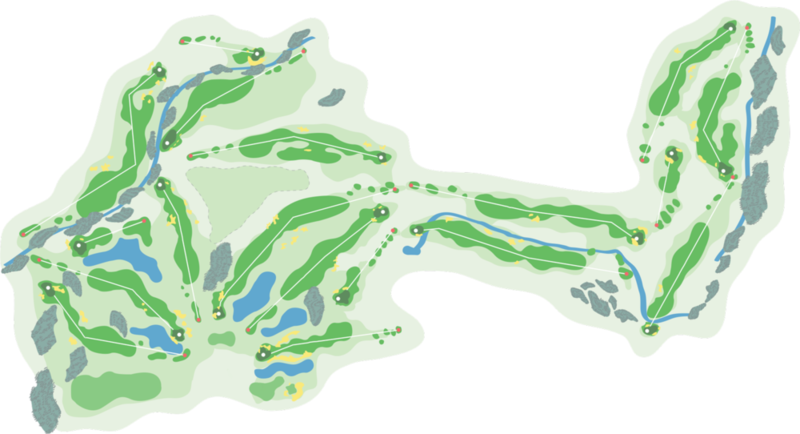 The 18-hole Championship Golf Course consists of two nines, the outward nine measuring 3210m and the inward nine, 3297m. The course is ideal for all levels of golfers with generous fairways and 5 different tee options on each hole so that you can choose the one that best suits your level of competence. Ensure that you have enough club for your second shot as the elevation and prevailing winds are deceptive. Keeping your ball in play is the key to your success on this long par 5. The undulating green is the trickiest part. It’s always better to be below the flag on this green that slopes from back to front. You need to control the distance on your second shot to this elevated green and if anything, try to miss a bit left. True risk and reward, you need to avoid the valley down the left side. Favour the right side off the tee as the ball will feed down to the fairway. Look out for the prevailing wind off the left. This is a 3 shotter for most so plan your attack and play to your strengths. There is a bit more space on the left than you think and ensure that you play the distance indicated. With the wind behind sometimes it’s no more than a 6 iron off the tee to play for position. Check the wind off the tee as driver is often too much club. If you don’t catch your drive, think of laying up down the left side and using your stroke. There is little reward if you can’t reach the green so choose a club that will keep you short of the bunkers off the tee. Choose the right club and play for the middle of the green. It takes two big hits to get home in two here but you need to pay attention to this multi- tiered green. Wind plays a big part in the club selection, check the tree tops if you can’t feel it on the tee. There is a lot more space to the right than you can see off the tee and check the pin position on this deep green. Don’t be fooled by the flag, the line off the tee is down the middle of the fairway favoring the left side. A tactical approach usually brings good results on the closing hole.